Avoid having to take penalty strokes. Cut out the three putts. If you do make a mistake, don’t make it worse by making further mistakes. Amateur golfers have a great tendency to over-estimate their abilities and so often end up taking needless penalty strokes that they could have avoided if they’d been more conservative in their shot selection. So the next time you’re considering that big shot that’s likely to only come off one time in ten if that, take time out to think about your options. And remember to focus on the shot you do elect to take on – don’t stand there thinking, “I don’t want to go into the water”. Rather you should be focussing on “I want to lay up just short of the water on the right hand side, to leave me with a nice pitch into the green where I can attack the flag”. There’s nothing more annoying than being on the green with a good birdie chance and walking off with a bogey because you’ve three-putted. And avoiding three-putting is key if you want to shoot lower scores. So the next few times you play a round, write down the putts you take on each hole and see how many times you three putt. You may be surprised at the number. Don’t be disheartened though – each of those three putts is a shot you can save in future. Take your time on the green. Don’t be impatient and rush things in your desire to get the ball in the hole. Make sure you go through your normal routine in preparation for the putt. This is especially important to remember if you’ve just missed a simple short putt. Step back and take the time to go through your routine again. In your anger and frustration don’t make things worse by rushing and missing again. Don’t get carried away and be too ambitious. Yes, it would be nice to make that birdie but if you do miss the birdie putt you want to make sure you leave yourself an easy par putt. So make sure you don’t go racing the ball past the hole in your eagerness for a birdie. Compounding your mistakes by making further mistakes and losing concentration is one of the worst things you can do, and one of the biggest contributors to high scores. Once you get into the frame of mind that it doesn’t matter anymore then you might as well stop playing there and then and go right back to the clubhouse and get the drinks in. Instead of losing concentration, take your time and go back to basics and play to your strengths. If necessary, opt for the conservative shot. For example, if you’ve just hit a bad shot into a bunker and you’ve got an awkward lie, you may be angry at the previous shot and be tempted to go for a big recovery shot that is unlikely to be successful and is more likely to get you into even more trouble. Instead, consider going for the conservative option of chipping out of the bunker back onto the fairway and making sure your next shot from the fairway is a good one. Believe me, your score card will thank you for it! 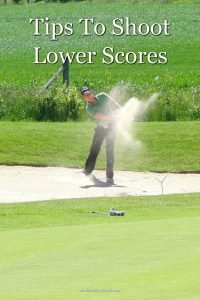 If you follow the advice in this article, you’ll be giving yourself a much better chance to shoot lower scores. Keep the above three things in mind each time you play and I’m sure you won’t have any trouble improving your round. And the best thing is that as these are simple steps you can take, rather than complicated changes to your technique, you can reap the benefit from them immediately.